I inked the top half of my card with my embossing ink dabber, and heat embossed with Northern Lights embossing powder from the Allure range. Next I inked a strip along the middle, again with my dabber, and heat embossed it with Dirty Sand from the Baked Texture selection. And last but not least I inked the bottom part and used the Rocky Road Baked Texture granules to create my asphalt. The pics don't do any of it justice as you cannot feel how real this feels and looks! After it all cooled down I stamped a skyline with the Aldergrove and Summer Camp stamps. 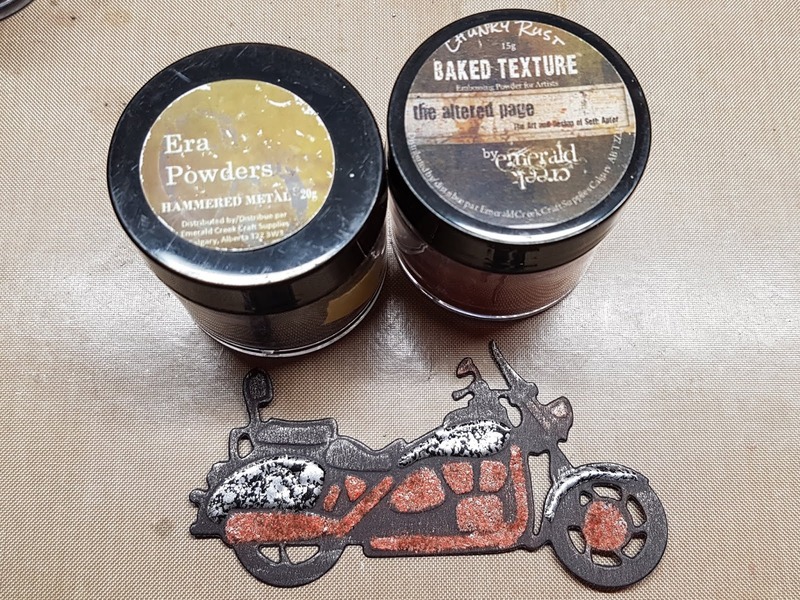 I used a permanent ink as that is suitable for stamping over non porous surfaces like heat embossing. After the ink dried I "coloured" over each tree with an embossing pen. 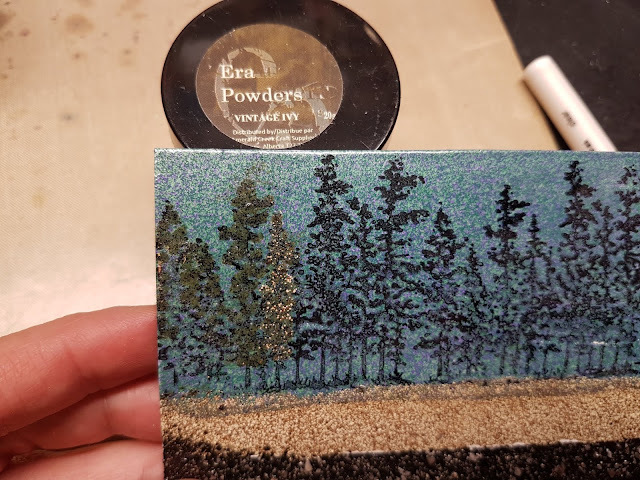 I did tree by tree as I used various embossing powders to "paint" my trees. I used Forrest Folliage and Ammo Camo from the Allure collection and Vintage Ivy from the Era range. I love how they made these trees come alive! I die cut and dry embossed the motorbike and then took my embossing pen again to "paint" it. The fenders and gas tank are Hammered Metal from the Era granules, the seats are done with Mercury Rising from the Allure powders and the rusty bits... you guessed it, I did those with Chunky Rust Baked Texture. I tell you, once you played with all these... you wonder how you ever did without them!!! 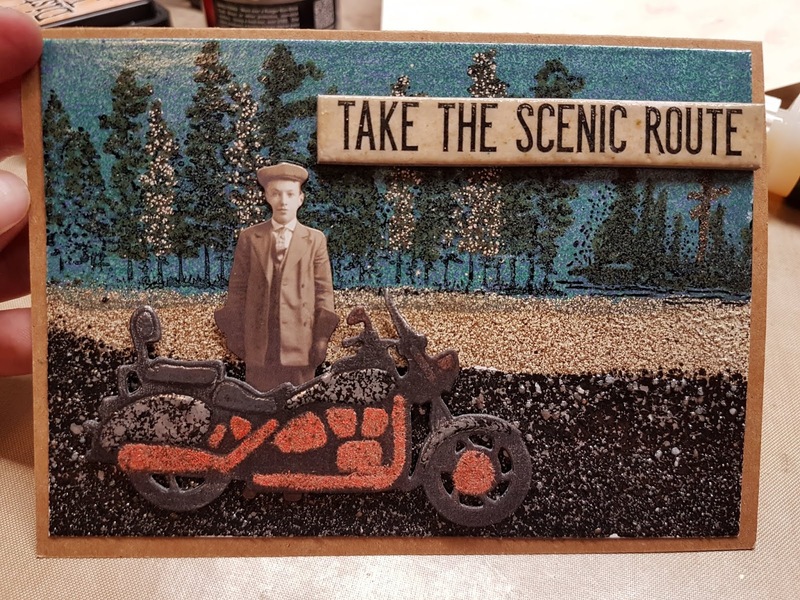 I glued my paper doll and stuck my bike on the card and for the sentiment I used a Tim Holtz embellishment that I "antiqued" with Vintage Beeswax Baked Texture granules. And voila, you have a guy style card! I absolutely love this card! 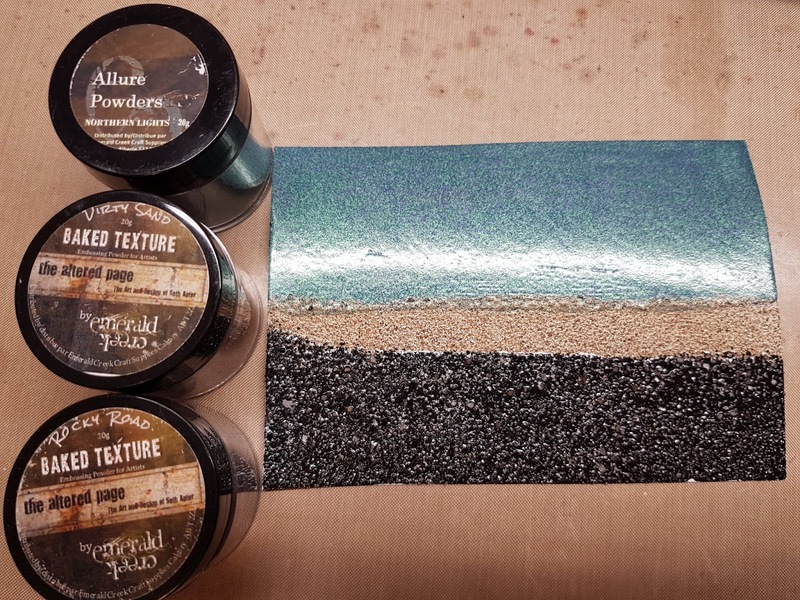 Learned of some new powders that look interesting to me too and I know that they will be every bit as fabulous as the others I own! I love the way the background looks and adding the different texture and color to the tree line took it up another notch! He has reason to stand proud behind that super cool motorbike! Fabulous make!